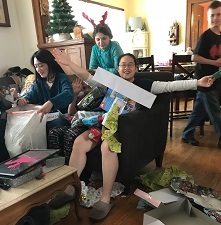 When the Richards family welcomed Yufei, or Joy as her American friends and family have come to know her, from her home country of China in the fall of 2016, they met a shy and quiet girl. Joy entered the 11th grade at a private school in Davenport, Iowa, not knowing what to expect. She struggled at first to meet people and did not have a great deal of motivation to get involved in school activities. At her host family’s home, she spent most of her time in her bedroom sleeping, and did not spend much time participating in activities with them nor socializing with them. 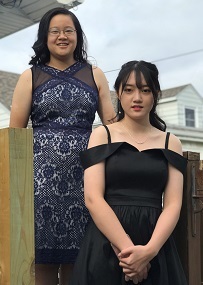 Throughout the school year, Joy started gaining confidence and made more of an effort to talk to people at school and at home in her host family. When she returned to the Richards family for the 2016-17 school year, her host family welcomed an outgoing, confident, social Joy into their family. “Last year, Joy hardly ever came out of her room. I talked with her many times about being more social in the family. When she returned in August of this year, we had a new Joy! She would come out to watch cooking programs on YouTube with us. These cooking programs were about food prepared in China,” shares her host mother. This was evident at school as well. 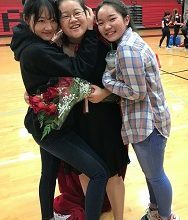 Joy joined the powder puff football team, the school choir, community service projects, and assisted her Local Coordinator with the new student orientation, leading conversations and helping to break the ice among the new international students. Joy found it much easier to meet people, and has made many friends at school. Joy’s classmates have enjoyed getting to know her better and appreciate her sense of humor. This fall, they elected her Homecoming Queen. “Being elected Homecoming Queen was like a dream – I still can’t believe it. 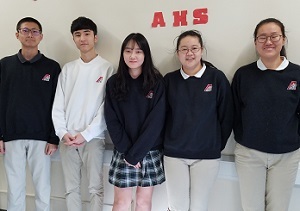 It felt so good, and I think this will be one of my best memories at AHS,” Joy shares. Joy has been grateful to have the opportunity to participate in the PSE program. She has enjoyed living in Davenport, where the weather is very similar to that of her hometown in China. She appreciates that people have been very nice, and notes that she has been in a happy mood almost every day since arriving. Wherever she ends up for college, we are confident that Joy will use the skills and experience gained from the program to excel in her new environment.